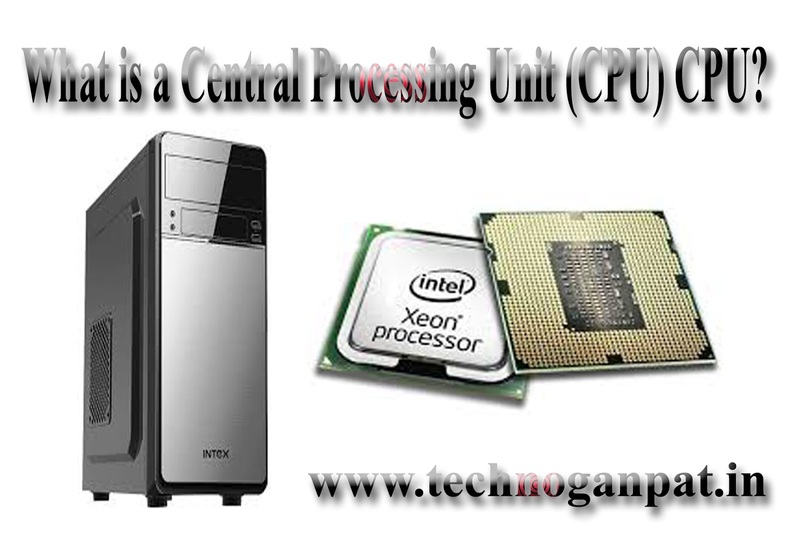 What is a Central Processing Unit (CPU) CPU? Central Processing Unit (CPU) is a component of computer that is responsible for the interpretation and execution of most commands from other computer hardware and software. A CPU is used in all devices of desktops, laptops, tablet computers, smartphones ... even in that it includes your flat-screen television set. Intel and AMD are the two most popular CPU manufacturers for desktops, laptops and servers, while Apple, NVIDIA and Qualcomm create CPUs for larger smartphones and tablets. You can see and hear many different names used to describe the CPU such as processor, computer processor, microprocessor, central processor and "brain of computer" etc. What does the CPU look like and where is it located? A modern CPU is usually made of small and square shapes, which include several small, round, metal connectors. Some older CPUs have a pin rather than a MetLicic connector. The CPU is placed directly in "Socket or Slot" which is located on the motherboard. The CPU is inserted in the socket by placing the pin portion on the bottom side and locked by a small lever that helps in keeping the processor safe. The modern CPU can be very hot even though only a while. To help eliminate this heat, it is almost always necessary to put a heat sink and a fan on top of the CPU. The clock speed of a processor is measured in GHz. This is the number of instructions processed by the processor in any one second. For example, a speed CPU speed of 3.0 GHz (Ghz) could process 3 billion instructions per second. Some devices have a single-core processor whereas some may have dual-core (or quad-core, etc.) processors. Having two processor units in the processor, both units can simultaneously handle the instructions each second, and the efficiency of the processor is noticeably improved. Some CPUs can virtualize two core for each physical core that is available, which is known as hyper-threading. Virtualization means that a CPU with only four cores gives the impression of eight cores. Neither clock speed nor the number of CPU cores, the only factor is whether or not a CPU is better than the other. It depends on the type of software running on the computer. A CPU has less clock speeds, but it is a quad-core processor, while the second has a clock speed, but only a dual-core processor. Now to decide which CPU is better, it will depend on the CPU for which purpose it is being used. Another component of the CPU is Cache. CPU cache is like a temporary storage for the data normally used. For this, the term Random Access Memory - RAM is not used because here the CPU determines which data you use repeatedly, store it in CPU cache. Cash memory is faster than RAM because it is a physical part of the processor; Higher cache means more space to keep such information. Whether your computer can run 32-bit or 64-bit operating systems, depending on the size of the data units that the CPU can handle. Instead of 32-bit, a 64-bit processor needs more memory in large pieces, which is why 64-bit ready operating systems and applications can not be run on 32-bit processors. Shortcut Key for refresh in windows 8.1 - List of Shortcut Keys - New! What Is ROM in Hindi - रोम क्या है और कितने प्रकार के है - New! What is Modem in Hindi ? Modem क्या है ? - New!